Gunnbjörn Ulfsson (c. 10th century), also Gunnbjörn Ulf-Krakuson, was a Norwegian settler in Iceland. He was reportedly the first European to sight Greenland. A number of modern place names in Greenland commemorates Gunnbjörn, most notably Gunnbjørn Fjeld. The only reference to Gunnbjörn is from the Book of Settlement of Iceland (Landnámabók). It is stated that his sons lived in Iceland's Westfjords and a note is made that Gunnbjörnssker are named after him. Gunnbjörn was blown off course while sailing from Norway to Iceland. He and his crew sighted islands (Gunnbjörn's skerries) lying close off the coast of Greenland, and reported this find but did not land. 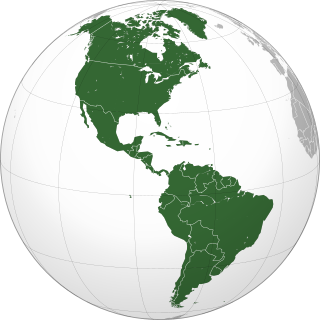 Since Greenland is physically part of North America, separated from Ellesmere Island by only a narrow strait, this sighting could also have been the first European connection with North America. The exact date of this event is not recorded in the sagas. Various sources cite dates ranging from 876 to 932. The first records of purposeful visits to Gunnbjörn's skerries were made by Snæbjörn Galti around 978 and soon after by Erik the Red who also explored the main island of Greenland, and soon established a settlement. Waldemar Lehn (1911-2005), professor emeritus at the University of Manitoba and an expert in atmospheric refraction and mirages, argued that the skerries Gunnbjörn saw could be explained as the sighting of Greenland's coast via the refraction of a superior mirage. Such phenomena were not unknown to the Norse, who called them hillingar. ^ Encyclopædia Britannica. 10. Chicago. 1955. p. 858. ^ "Greenland's Lost Islands". The History of Nothing. September 22, 2013. Retrieved January 20, 2016. ^ "Gunnbjörn Ulf-Krakuson & Greenland". University of Victoria, Medieval Mapping Project. 31 January 2012. Retrieved January 20, 2016. ^ Lehn, Waldemar (Jul 2000). "Skerrylike mirages and the discovery of greenland". Applied Optics. PMID 18349932. ^ Seaver, Kirsten A. The Last Vikings: The Epic Story of the Great Norse Voyagers. pp. 16–17. ISBN 9781784530570. Greenland is an autonomous constituent country of the Kingdom of Denmark between the Arctic and Atlantic oceans, east of the Canadian Arctic Archipelago. Though physiographically a part of the continent of North America, Greenland has been politically and culturally associated with Europe for more than a millennium. The majority of its residents are Inuit, whose ancestors began migrating from the Canadian mainland in the 13th century, gradually settling across the island. Vinland, Vineland or Winland is the area of coastal North America explored by Norse Vikings, where Leif Erikson first landed in ca. 1000, approximately five centuries prior to the voyages of Christopher Columbus and John Cabot. Vinland was the name given to North America as far as it was explored by the Norse, presumably including both Newfoundland and the Gulf of Saint Lawrence as far as northeastern New Brunswick. Geologically, a fjord or fiord is a long, narrow inlet with steep sides or cliffs, created by a glacier. There are many fjords on the coasts of Alaska, Antarctica, British Columbia, Chile, Greenland, the Faroe Islands, Iceland, Kamchatka, the Kerguelen Islands, New Zealand, Norway, Novaya Zemlya, Labrador, Nunavut, Newfoundland, Quebec, Scotland, South Georgia Island, and Washington state. Norway's coastline is estimated at 29,000 kilometres (18,000 mi) with nearly 1,200 fjords, but only 2,500 kilometres (1,600 mi) when fjords are excluded. The history of Greenland is a history of life under extreme Arctic conditions: currently, an ice cap covers about 80 percent of the island, restricting human activity largely to the coasts. Erik Thorvaldsson, known as Erik the Red, was a Norse explorer, remembered in medieval and Icelandic saga sources as having founded the first settlement in Greenland. According to Icelandic sagas, he was born in the Jæren district of Rogaland, Norway, as the son of Thorvald Asvaldsson. He therefore also appears, patronymically, as Erik Thorvaldsson. The appellation "the Red" most likely refers to his hair color and the color of his beard. 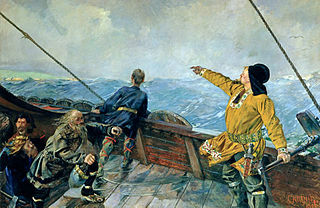 Leif Erikson, the famous Icelandic explorer, was Erik's son. Leif Erikson or Leif Ericson was a Norse explorer from Iceland. He was the first known European to have set foot on continental North America, before Christopher Columbus. According to the Sagas of Icelanders, he established a Norse settlement at Vinland, tentatively identified with the Norse L'Anse aux Meadows on the northern tip of Newfoundland in modern-day Canada. Later archaeological evidence suggests that Vinland may have been the areas around the Gulf of St. Lawrence and that the L'Anse aux Meadows site was a ship repair station. The Norse people or Norsemen were a group of Germanic people who inhabited Scandinavia and spoke what is now called the Old Norse language between c. 800 and 1300 AD. The language belongs to the North Germanic branch of the Indo-European languages and is the predecessor of the modern Germanic languages of Scandinavia. In the late eighth century Norsemen embarked on a massive expansion in all directions. This was the start of the Viking Age. The Norse colonization of North America began in the late 10th century AD when Norsemen explored and settled areas of the North Atlantic including the northeastern fringes of North America. Remains of Norse buildings were found at L’Anse aux Meadows near the northern tip of Newfoundland in 1960. This discovery aided the reignition of archaeological exploration for the Norse in the North Atlantic. Gunnbjørn Fjeld is Greenland's highest mountain and also the highest mountain north of the Arctic circle. A skerry is a small rocky island, usually too small for human habitation. It may simply be a rocky reef. A skerry can also be called a low sea stack. The Novaya Zemlya effect is a polar mirage caused by high refraction of sunlight between atmospheric thermal layers. The Novaya Zemlya effect will give the impression that the sun is rising earlier than it actually should, and depending on the meteorological situation, the effect will present the Sun as a line or a square, made up of flattened hourglass shapes. The mirage requires rays of sunlight to have an inversion layer for hundreds of kilometres, and depends on the inversion layer's temperature gradient. The sunlight must bend to the Earth's curvature at least 400 km to allow an elevation rise of 5° for sight of the solar disk. Grœnlendinga saga is one of the sagas of Icelanders. Along with Saga of Erik the Red, it is one of the two main literary sources of information for the Norse exploration of North America. It relates the colonization of Greenland by Erik the Red and his followers. It then describes several expeditions further west led by Erik's children and Þorfinnr "Karlsefni" Þórðarson. Erik the Red's Land was the name given by Norwegians to an area on the coast of eastern Greenland occupied by Norway in the early 1930s. It was named after Erik the Red, the founder of the first Norse or Vikings settlements in Greenland in the 10th century. 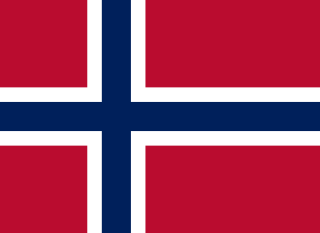 The Permanent Court of International Justice ruled against Norway in 1933, and the country subsequently abandoned its claims. 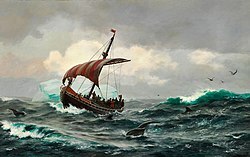 Snæbjörn galti Hólmsteinsson was the first Norseman to intentionally navigate to Greenland, doing so in 978 CE. 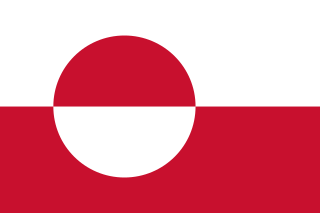 Greenlandic independence is a political ambition of some political parties, advocacy groups, and individuals of Greenland, an autonomous country of the Kingdom of Denmark, to become an independent sovereign state. Herjolfsnes was a Norse settlement in Greenland, about 50 km northwest of Cape Farewell. It was established by Herjolf Bardsson in the late 10th century and is believed to have lasted about 500 years. The fate of its inhabitants, along with all the other Norse Greenlanders, is unknown. The site is known today for having yielded remarkably well-preserved medieval garments, excavated by Danish archaeologist Paul Norland in 1921. Its name roughly translates as Herjolf's Point or Cape.